There has been a lot of excitement in the market recently around business analytics in general and specifically around predictive analytics. The promise of moving away from the typical rear view mirror approach to a predictive, anticipatory approach is a very compelling value proposition. But, just how can this be done? Predictive models are complex. So, how can companies use them to their best advantage? A number of ideas have emerged to make this happen including 1) making the models easier to build in the first place and 2) operationalizing models that have been built so users across the organization can utilize the output of these models in various ways. I have written several blogs on the topic. Given the market momentum around predictive analytics, I was interested to speak to members of the Aha! Team about their spin on this subject, which they term “Business Embedded Analytics.” For those of you not familiar with Aha! the company was formed in 2006 to provide a services platform (i.e. SaaS platform called Axel ) to embed analytics within a business. The company currently has customers in healthcare, telecommunications, and travel and transportation. The idea behind the platform is to allow business analysts to utilize advanced business analytics in their day to day jobs by implementing a range of deterministic and stochastic predictive models and then tracking, trending, forecasting and monitoring business outcomes based on the output of the model. In this instance, these are actual not forecasted values of the KPIs (although this could represent a modeled goal). 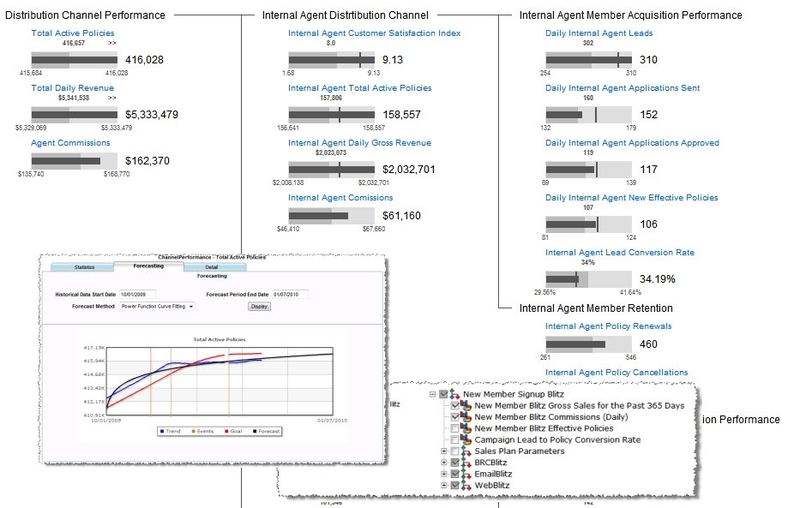 For example, the KPI on the lower right hand corner of the screen is called Internal Agent Member Retention. This is actually a drill down of information from the Distribution Channel Performance. The KPI might represent the number of policies renewed on a particular reference date, year to date, etc. If it was a modeled KPI, it might represent the target value for that particular KPI (i.e. in order to make a goal of selling 500,000 policies in a particular time period, an internal agent must sell, say 450 of them). This goal might change based on seasonality, risk, time periods, and so on. Aha! provides tools for collaboration among analysts and a dashboard, so that this information can be shared with members across the organization or across companies. Aha! Provides a series a predictive models, but also enables companies to pull in the models from outside sources such as SAS or SPSS. The service is currently targeted for enterprise class companies. What does this mean? Simply this: that the model, once created, is not static. Rather, its results are part of the business analyst’s day to day job. In this way, companies can develop a strategy (for example around acquisition or retention), create a model to address it, and then continually monitor and analyze and act on what is happening to its customer base.